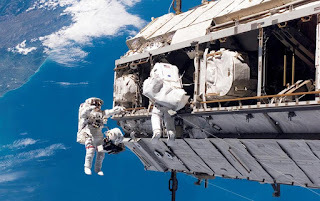 CAPE CANAVERAL, FLA.. (AP) — The Trump administration wants NASA out of the International Space Station by 2025, and private businesses running the place instead. Under President Donald Trump's 2019 proposed budget released Monday, U.S. government funding for the space station would end by 2025. The government would set aside $150 million to encourage commercial development. Many in space experts are expressing concern. Sen. Bill Nelson, a Florida Democrat who rocketed into orbit in 1986, said "turning off the lights and walking away from our sole outpost in space" makes no sense. Retired NASA historian and Smithsonian curator Roger Launius notes that any such move will affect all the other countries involved in the space station; Russia is a major player, as is Europe, Japan and Canada. "I suspect this will be a major aspect of any decisions about ISS's (space station's) future," Launius wrote in an email. SpaceX and Boeing, meanwhile, are developing crew capsules to fly astronauts to and from the space station within the next year. These commercial flights will represent the first astronaut launches from U.S. soil since NASA's shuttles stopped flying. A complete transfer to the commercial sector is a different matter, however. Mike Suffredini, a former space station program manager for NASA who now runs Axiom Space in Houston and aims to establish the world's first commercial space station cautioned that the U.S. government needs to have a direct hand in the International Space Station until it comes down. No company would accept the liabilities and risks associated with the station, he said, if the sprawling complex went out of control and came crashing down. His company's plan is to attach its own compartments to the existing International Space Station and, once the decision is made to dismantle the complex, detach its segment and continue orbiting on its own. "For us, 2025 is the beginning of a conversation," Suffredini said. He said he is happy that the administration is forcing a discussion now about how and when to retire the space station. Altogether, the administration's proposed budget , along with an addendum , seeks to increase NASA's budget slightly to $19.9 billion. About $10 billion is targeted for human space exploration and to "pursue a campaign that would establish U.S. preeminence to, and around, and on the moon," according to the proposal. While the budget plan said it places renewed support on returning humans to the moon, followed by human expeditions to Mars and elsewhere, no precise timeline and few details are provided. The supersize Space Launch System rocket being built by NASA to send astronauts beyond low-Earth orbit — along with its Orion crew capsule — would get $3.7 billion under this budget. A test launch of this system would remain on track for 2020, with a first crewed launch around the moon three years later, according to budget details. "We are once again on a path to return to the Moon with an eye toward Mars," said NASA's acting administrator Robert Lightfoot in a statement. In an agency-wide address he said it was a "very exciting" budget with lots of potential, despite some hard decisions. Among them: the proposed cancellation of a telescope under development called WFIRST that would try to solve cosmic mysteries such as the nature of dark energy, as well as to look for planets like our own around distant stars.